This holiday season I was very fortunate to receive a Wii. Much as many others out there, I had been wanting this amazing little unit ever since it came out. The fact that it's the most affordable of all three next-gen systems does make it more appealing, though it's high demand means that you're lucky to find one anywhere. Especially for Christmas. Now that the holidays are behind us, we can only hope that supply will begin to catch up with the demand. 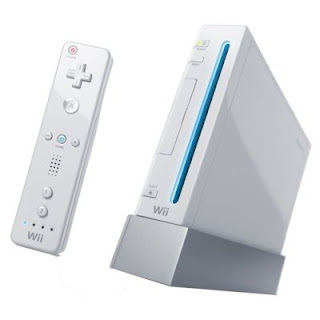 I have read and heard many wonderful stories about the Wii of course. Yet I must say, that nothing really compares to trying it out first hand. When it comes to the exciting new control method that is the Wii Remote, playing is believing. Though right now our library is limited, with three titles including the obligatory Wii Sports, as well as Wii Play and Cooking Mama, it suffices in generating excitement about this new technology. We must have spend pretty much all of Christmas day playing the Wii, and that's just with the first two games as we got Cooking Mama more recently. The first thing I noticed is just how strange it felt to be moving this much while playing a game! Sure I've played my share of Guitar Hero and DDR, but this is rather different. These are not rhythm games, so it's a new experience all together. 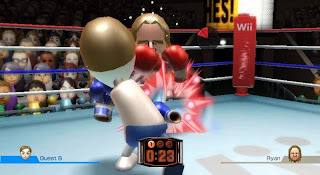 Some of Wii Sports is fairly leisurely, but other parts of it, such as Tennis, Baseball, and Boxing are much more physically intense. At one point after three rounds of Boxing I started to actually break a sweat. Awesome. The original idea was to set up the Wii on Christmas Eve and subject the rest of my family to its hypnotic powers, but it just didn't happen. I pleaded, but my family just wasn't into it at all. Plus it was late and everybody was tired. Oh well. So I yet have to convince them of just how great this piece of equipment really is. Since the move,there hasn't been any time to arrange a get-together, but I hope to remedy this in the coming months. So yes, the Wii is excellent for getting you more physically engaged with its games, and yes it is also fairly intuitive to pick up thanks to the Wii Remote controller. However, I find there is one other aspect of this console that makes it smarter than other consoles. 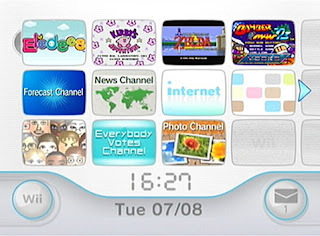 Beyond playing games, the main menu on the Wii is arranged into "channels." Two channels in particular caught my interest. Aside from your Mii Channel, Photo Channel, and the Shop Channel you also have a Forecast Channel and a News Channel. The latter both get the most current information off the net, and I found myself spending a bit of time with both. 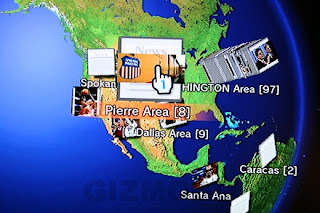 When you access these channels, you have the capability of spinning the globe by holding and the dragging on the map next to your particular news or weather item on screen. This essentially provides several functions. For one, as the article or weather item fades away, you are left with an interactive globe which is just fun for a quick geography lesson (and even a little star gazing!). Consequently you can check the weather in most other places in the world, which is in fact of particular interest to me. 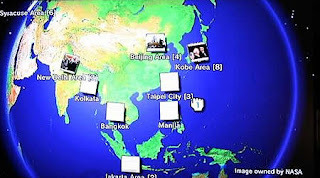 And finally, when in the News Channel, you can see various articles placed on the globe to read wherever you're looking. So if I'm spinning the globe towards Asia, and I see some articles piled up in Japan, I get curious as to what's going on over there and generally read some of them. Yes, these are all very simple devices, and you can certainly access all of that information and more online. Still, this intuitive visual model of information around the world brings the element of curiosity into play the way that using Google does not. I suspect that this may be particularly useful for a younger audience. Perhaps it will help to make Wii users around the world more informed as to what's going on globally. I don't know, but I think the potential is there. Besides, one can always hope. Ultimately, I am very much a fan of the Wii. I think it has opened the door for a multitude of applications that are unconventional and innovative which we have but only glimpsed the beginning of. Is the Wii going to save the world? No not really. Will it help to make the world a better place? Well, maybe. Is it going to revolutionize the future of electronic gaming? Absolutely.